Started the day by signing 50 copies of The New Green Consumer Guide at Pearl Fisher’s offices near Hammersmith. I have formed a loose alliance with this design company, who work with companies such as Innocent Drinks and Green & Black Chocolate. They are sending out copies of my books to clients along with a letter telling them about the new relationship. We will principally be working on packaging projects – identifying how to minimise waste, whilst maximising eco-performance. Followed this with a meeting at Waterloo. Discussing a TV idea with a director but not yet able to disclose what it is! Moved to another coffee bar, where I met Joel Makower, the American adaptor of the original Green Consumer Guide, who I haven’t seen for about 18 years. We recognised each other instantly and spent nearly 2 hours deep in conversation discussing a range of subjects from carbon offsets, personal carbon quotas, green marketing, corporate green initiatives, publishing etc. Joel was particularly intrigued by the headlines in UK newspapers about carbon labelling of food and other products. As he notes in his blog ( http://makower.typepad.com) – where he describes me as the ‘earth mother of green consumerism’ – I’m not over-excited by the idea of labelling a vast array of products with their carbon impact. I think there’s still some way to go on this. 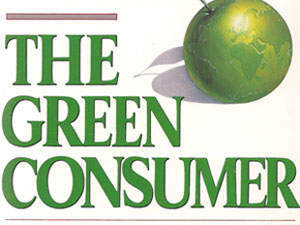 Interestingly, Joel’s work profile is not dissimilar to mine but was strongly influenced by his writing the American Green Consumer book, which was published in 1990. I rushed off to London Bridge – to Blue Rubicon’s offices – they’re the PR company for a number of blue chip companies, such as McDonalds, Cadburys and Unilever. They’d asked me to come and join what they call their ‘brown bag’ lunch session. This involved sandwiches and a drink (consumed fairly swiftly) followed by giving a presentation of my views on the environmental debate and some background on my book and corporate clients. Didn’t hurry back to Waterloo because I had plenty of time before my train was due – or so I thought. My dallying meant I missed a train that was late departing by 10 minutes and the ones following were cancelled. Huge hassle getting home caused by some wretched person committing suicide on the tracks. I’m afraid I had little sympathy, just frustration….. This entry was posted in About me, BLOG, Done, Media & Communications, News 2007. Bookmark the permalink.